IBM recently announced a partnership with upstart genetics company Pathway Genomics to create a Watson-powered app to provide personalized health information based on a patient’s genetic profile, data collected from personal health trackers, medical literature, and whatever other information it can get its hands on. Called Pathway Panorama, the smartphone app will make it possible for individuals to ask questions in everyday language and get answers in less than three seconds that take into consideration their personal health, diet and fitness scenarios combined with more general information. The result is recommendations that fit each of us like a surfer’s wet suit…[Say] you’re diabetic and you’re in a city you have never visited before. You had a pastry for breakfast and you want to know when you should take your next shot of insulin. In an emergency, you’ll be able to find specialized healthcare providers near where you are who can take care of you. That’s a pretty impressive claim, highlighting both the remarkable potential and apparent risks with an app like Pathway. Nova suggests that the app will be available some time in the middle of 2015. While it’s possible that there is extensive testing being undertaken now to ensure the safety of an app that could provide such specific and potentially high risk recommendations, it’s more likely that this app will be crafted to avoid FDA oversight. And while there are implementations of Watson in supporting care decisions elsewhere in medicine like oncology, there’s one big difference here. Those applications give recommendations to a “learned intermediary” like a physician or nurse – someone who takes this advice in conjunction with clinical specifics and their own knowledge to make the actual decision. Here, the recommendation would be going directly to the patient and is slated to be highly personalized, unlike say a simple Google search. Regardless of what the actual scope and capabilities of the released app end up being, the integration of the veritable mascot of “big data” with the smartphone is something of which healthcare professionals should take note. 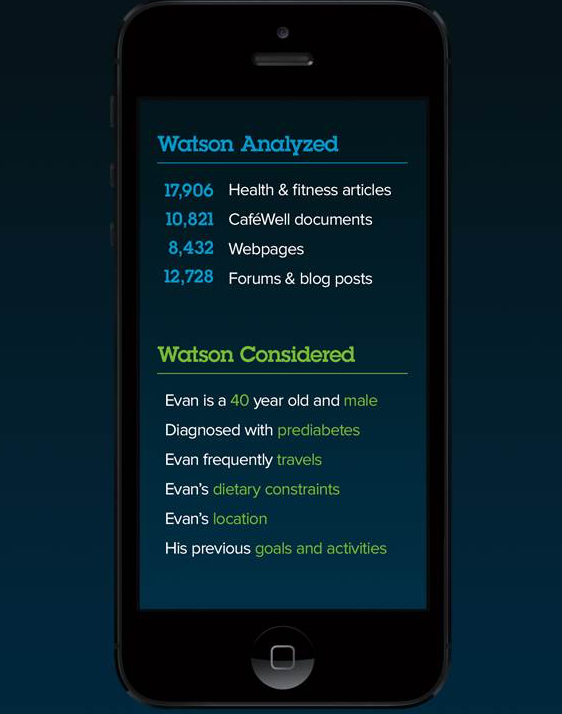 What will Pathway and Watson do with your genomic information and associated personal info after they answer your question? Is it erased? Is it added to their knowledge base? Can the patient choose? Great points. Pathway is a genetic testing company so would obviously have that information stored. As best as I could gather, no data will be stored by IBM. But that will be a very important question when the app is being released next year. Pathway, Foundation Health, and CollabRX seem to be following the same script: “Let’s turn patient data into intellectual property and sell it.” What happens when all patient data is siloed into proprietary for-profit databases? Does open medicine disappear into one big Watson?